Firsova’s music here is more about suggestion and allusion than forcing it upon you. 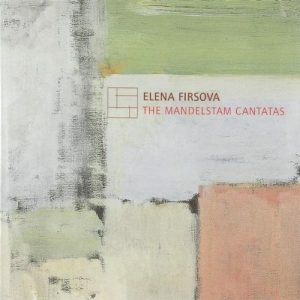 When you don’t speak Russian, it’s not entirely easy to connect with Elena Firsova’s Mandelstam Cantatas (composed in 1984, 1987 and 1994). Although Russian text and English translation are provided, it’s easy to get lost in the Cyrillic alphabet of the original, and the translation seems awkward, or maybe the translation is very faithful to Mandelstam’s poetry and it’s Mandelstam’s poetry that is awkward and cryptic. So it’s hard to relate to what’s being sung, the meaning of the words and the emotional content of that meaning. For all I’m concerned, the soprano could have been singing invented phonemes. In fact, I found it best to consider that the soprano was singing simple phonemes, sounds without meaning or only with very vague meaning, and concentrate on the music of Firsova, as if it were “pure” music with soprano voice used instrumentally. And there are many beauties in her music, hushed whisperings of strings in the high or low registers over softly tinkering harp or celesta and caressing clarinet, solo flute dancing distressed or defiant dances, solo violin whispering in the high registers like a lost bird, sensuous surges of the string quartet like a geyser joyfully spurting, mystical and mysterious chromatic fantasies, occasionally seeming to play at a distance, a lamenting solo for cello, a solo for horn on a hushed carpet of strings that seems to pay homage to Britten’s Serenade (track 12), moments of obstinate and pointillistic repetition, insect music in a manner that vaguely recalled the String Quartet of George Crumb (beginning of track 6), and a few, very occasional and short demented instrumental explosions. Firsova’s music here is more about suggestion and allusion than forcing it upon you. There’s a sensuousness of sound and timbre in the music that is very fascinating. I don’t hear any major stylistic evolution from 1987 to 1994. Elena Firsova was born in 1950, and she’s part of that generation of composers who came to age in the decaying days of the Soviet empire and the stultifying Brezhnev years but, whether in the open or in concealment, embraced modernism, and not just an imitation of the trends in vogue in the West, but speaking very much their own voice. She also has the honor of being one of the seven that were violently decounced by Soviet music komissar-in-chief Tikhon Krennikov in 1979, the others being Gubaidulina, Denisov (members of a generation born 20 years earlier), Viktor Suslin, Vyacheslav Artyomov, Alexander Knaifel and Firsova’s husband Dmitri Smirnov – for some reason, Schnittke wasn’t afforded the same honor. She and her husband ultimately emigrated to England in 1991, the year of the demise of the Soviet Union, and became British citizens. I’ve just reviewed the Introduction to Dmitri Smirnov on the same label, Megadisc Classics, and I had reviewed other pieces of Firsova earlier, piano pieces on “Genia Unveiled: Music From Russia’s Women Composers” and her third and fourth string quartets on “Lydian Quartet in Moscow and “Stravinsky, Schittke, Roslavets, Smirnov, Firsova – Chilingirian String Quartet. Spoprano Ekaterina Kichigina has a great Russian voice, very plumpy, almost mezzoish, but rising very high and capable of singing piano in the high registers. TT 59 minutes.